Today is Hallowe’en which according to many sources is based on ‘Celtic’ traditions, because the Celtic year begun on the first of November. While Hallowe’en is not necessarily about the dead (more about the undead) it falls on the night before All Saints’ Day. The Hallow part of the word is derived from Old English halga [saint] plus the abridged word evening. While the custom of celebrating Hallowe’en is associated with the US, which had a large influx of Celtic immigrants, there are other traditions which roughly fall to the same time of year. In Germany children go from house to house with a lantern on St Martin’s Day (10 or 11 November depending whether it is a Protestant or Catholic region) and they are rewarded for singing with sweets. In Old English the month of November was known as blodmonað [blood month] which was named thus, according to Bede, because in pagan times it was a month of sacrifices. There is often a very pragmatic connection between religion and rituals and in November farmers had to consider how many animals they would keep over winter (which had to be fed and kept warm), so the surplus was slaughtered. In such a time of plenty, without modern freezers, you may as well sacrifice to your gods. In the same token Lent falls to a time of hunger – early spring is a time when the winter storage was depleted and the next possible harvest was a month or so off. 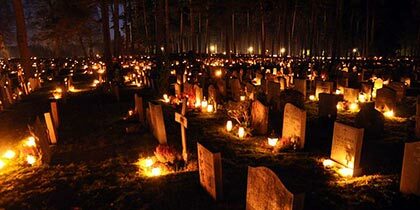 In many parts of Europe the 1st of November is still All Saints’ Day – followed by All Souls on November 2nd, a day on which all of the dead were remembered. Saints had a special place in medieval culture since, although dead, they continued to intercede on behalf of the living. Medieval culture was based on a principle of do-ut-des [I do so that you do for me], it was believed that if you wanted something you had to give something, so a saint may be more inclined to respond for an offering. In the early Christian period food was often taken to the shrines of saints – which was obviously based in rituals of eating with the dead. Pagan Anglo-Saxon funerals, for example, often contain food. That these are not just votive deposits or some provision for the afterlife is clear from the cooking pits in cemeteries and the occasional animal bone in the backfill of the grave. The grand spectacle of the early medieval funeral was aimed to create an unforgettable experience – and feasting the mourners seems to have been one aspect. Even today we hold a wake – usually after the funeral, but one last meal where we get together in the name of the dead. If we can believe the lamenting of medieval clerics cemeteries were jolly places. The sacrificial mortuorum [sacrifices for the dead] were explicitly forbidden in AD 743, but even in the tenth century we hear the cleric Hincmar berating those who perform singing, dancing, juggling and the wearing of masks in cemeteries. Carolingian priests were explicitly forbidden to allow drinking in honour of saints – which means that this must have been a wide-spread custom. The dadsisas which means sitting with the dead’ were a bone of contention in Frankish Capitularies, and the Anglo-Saxon cleric Ælfric warns his colleagues against drinking all night at wakes. The Church tried to convince people that instead of taking food to the dead, the money would be better spent on alms for the poor (which were administered by the church) and masses. So if we are looking for the origin of Hallowe’en we probably have many traditions coming together: a time for sacrifices and memory which was transformed into Christian rites. It is possible that the element of giving food to the dead – did not go away for some time, and that the ritual of feasting and appeasing the dead moved from the day of commemoration on 1st November to the evening before. Whatever the background, I have a stash of sweets with which I will keep the undead from my door tonight.